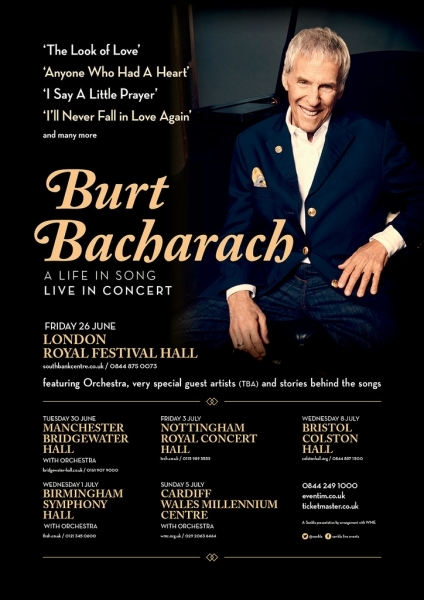 Burt Bacharach performing his A Life In Song Tour at The Royal Concert Hall Nottingham on Friday 3rd July 2015. 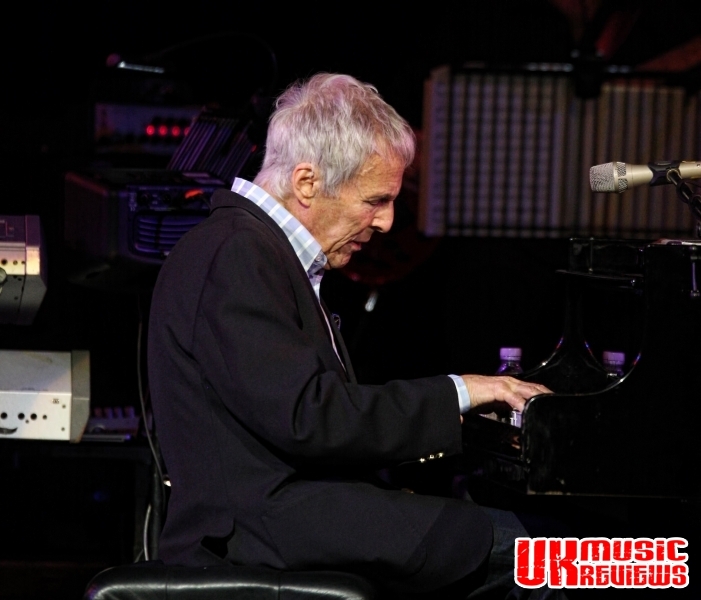 A true legend, Burt Bacharach, performed in Nottingham last night and a packed Royal Concert Hall was there to witness it. With a catalogue that places him and his late writing partner Hal David in the very top tier of twentieth century songwriters, the real challenge was choosing the songs for this two hour plus set. When talking about the many classic film scores and theme tunes he has written, he singles out the unlikely trio of Austin Powers 1, 2, and 3. “I can’t tell you what that’s done for my career; all the eight year olds suddenly knew my music”. 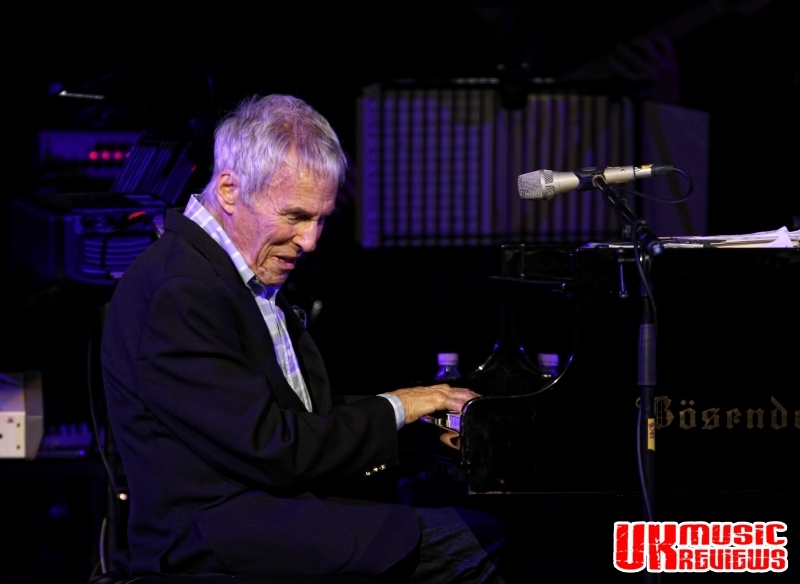 So at 87, Bacharach may look a little frail around the edges, but the king of easy listening now has tunes for every generation. 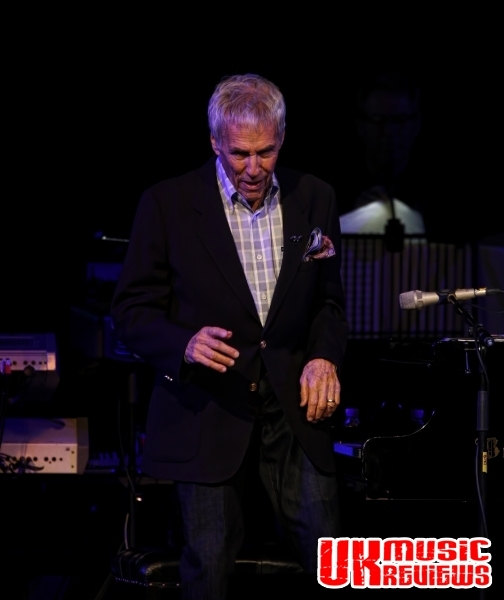 Tanned, grey haired and slightly shrunken, he moves deliberately around the stage. Sartorial elegance is given away to comfort, with an open neck shirt and blazer hanging over jeans and trainers. He plays, rolling around on a seat at his piano as if he cannot quite get comfortable, standing to conduct the beginnings and endings of his great compositions. 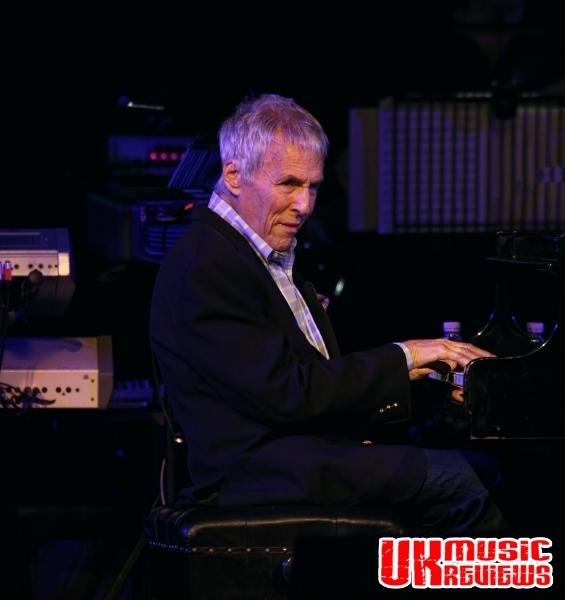 The entertainment began when he walked on stage to a standing ovation, and played a single note. Each of his three singers then sang a line of Jackie DeShannon’s What the World Needs Now (Is Love), before the superb seven piece band joined in. A medley of songs flowed deliciously one after the other; Dionne Warwick’s debut recording Don’t Make Me Over, her subsequent hit Walk On By, Herb Alpert’s This Guy’s In Love With You, I’ll Never Fall In Love Again and Gene Pitney’s Only Love Can Break A Heart were just tasters, as this audience sang along to their hearts content. There was a classic version of Chuck Jackson’s Any Day Now (My Beautiful Bird) sung wonderfully by John Pagano, which was followed by Bacharach telling us about Little Red Book. He said that this was his first attempt at writing rock ‘n’ roll and that it was written for Manfred Mann but was a flop. Three years later Arthur Lee’s Love took it up and changed the chords which Bacharach didn’t like, changed the melodies which he didn’t like and made it a big hit which he did like. Before Bill Contas delighted us with his version of that song, Bacharach mentioned that a Nottingham Journalist had, during an interview informed him that he had written a much sort after Northern Soul song; Long After Tonight Is All Over, by Jimmy Radcliffe. Such is the size of his extraordinary catalogue, we can forgive him if he needs to be reminded occasionally. (For that full interview by Kevin Cooper go to the link below). Other tales of how proud he was that The Beatles had recorded Baby It’s You enthralled this audience who hung on his every word. Whilst Dionne Warwick recorded many Burt Bacharach compositions, it was when he was talking about the late great Dusty Springfield, that it was clear for all to see that he had been genuinely fond of her. Whilst the singers were great, it was the songs that are the stars. Josie James delivered a superb version of Dionne Warwick’s first top ten hit, Anyone Who Had A Heart, whilst Donna Taylor gave us a cracking version of Etta James’ Waiting For Charlie (To Come Home). Following on was a medley of film themes which included Dusty Springfield’s The Look Of Love from Peter Seller’s classic Casino Royale, Arthur’s Theme (Best That You Can Do), Tom Jones’ What’s New Pussycat, and The Man Who Shot Liberty Valance to name but just a few. But when Bacharach took charge of the microphone for his own speak singing renditions of Alfie and A House Is Not A Home, performed with mournful late life wisdom, the effect was powerful, dramatic and very moving. In truth, everything about him creaks with advanced years, except his music, that have gorgeous melodies; unwinding with perfect ease around the smart lyrics provided by a host of legendary co-writers, dipping and rising through emotional highs and lows. 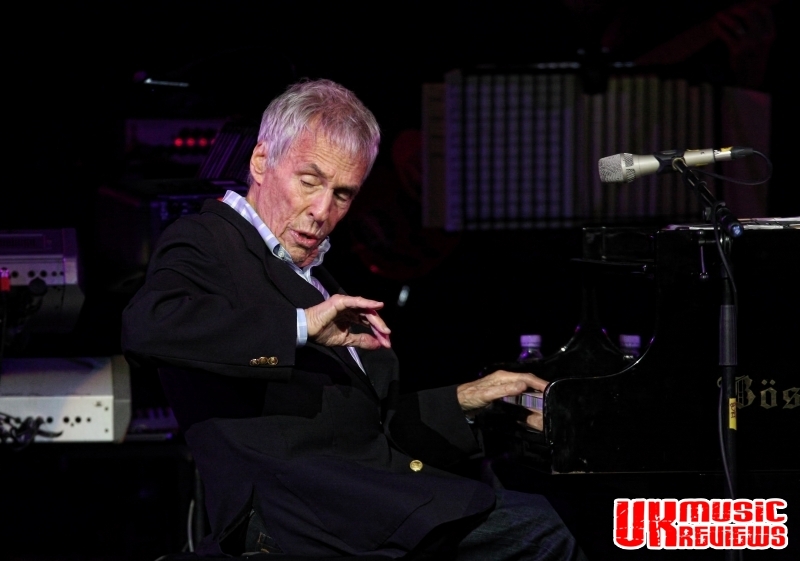 You can see just how much he loves his music, frequently rising from his piano stool to conduct the orchestra with peremptory hand gestures, and when playing he mouths along with the words. He clearly is the guardian of his own legacy. Introducing us to his son Oliver who joined him on keyboards, he proudly announced that “it is an absolute joy to be out on the road and have your son with you. 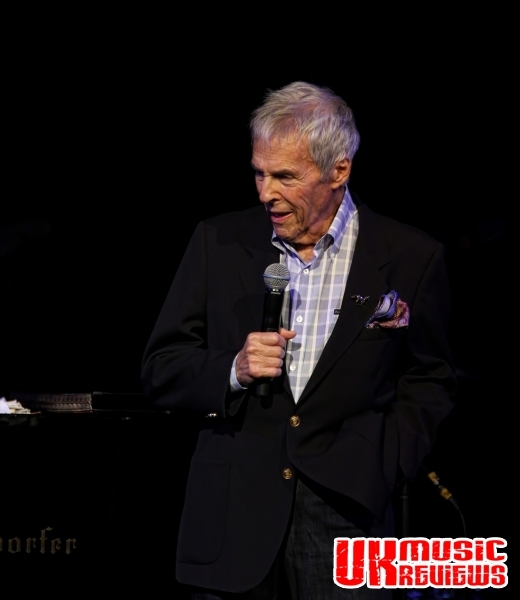 It doesn’t get any better.” And for Burt Bacharach, with his beaming smile, it is doubtful that it does. Finishing with That’s What Friends Are For, which was apt given that he had become reacquainted with old friends and had made many new ones tonight. But the highlight was Raindrops Keep Fallin’ On My Head written for the film Butch Cassidy And The Sundance Kid, which won him an Academy Award for The Best Original Song. It simply defied anyone not to sing along, and this appreciative audience didn’t hesitate. Exiting the Concert Hall to the worst storm seen this year, there were indeed raindrops falling on everybody’s head. But they didn’t seem to mind as they continued singing on their way home, long after this maestro had left the stage. It was a concert not to be missed.